The value of a Henry Kelsey, First Explorer of the Plains - 6 cents 1970 stamp depends on several factors such as quality and wear, supply and demand, rarity, finish and more. Values in the section are based on the market, trends, auctions and recognized books, publications and catalogs. This section also includes information on errors and varieties and characteristics. Henry Kelsey, credited with being the first white man to travel the vast western plains of Canada, accomplished his purpose because of a facility to identify with the native Indians, to travel and live with them and to endure on equal terms. 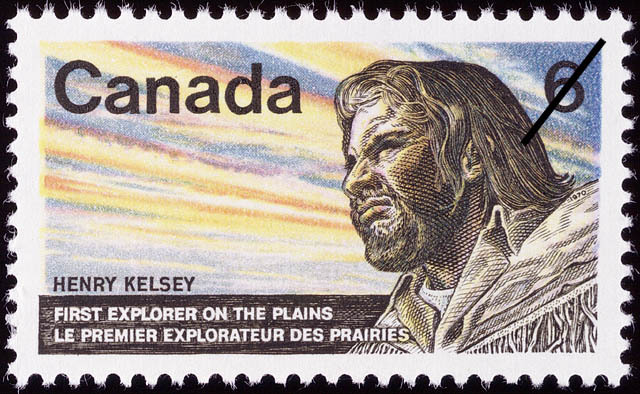 Although time has led to the acceptance of Kelsey as a trail-blazing explorer of Canada, he did not look upon himself as such. True to the conditions of his employment with the Company to which he had been apprenticed, Kelsey considered himself only as an agent to open new avenues of trade. Fragmentary documentation for years inhibited his acceptance as a true explorer of Canada. Even after his death in England in the 1720's there were determined attacks on the Hudson's Bay Company questioning the rights granted in the famous Charter of 1670 and charging that the obligation to explore had not been fulfilled. Suggestions were made that Kelsey, instead of being despatched by the Company from their Post on the Bay, has, as an impulsive 20 years old, rebelled and run away to travel aimlessly with the Indians.Prominent in the agitation against the Company was Arthur Dobbs who, in 1754, left his ancestral castle in Northern Ireland to become Governor of North Carolina. Eventually, in 1926, during cleaning operations in the Dobb's Castle library in Ireland, papers of great historic significance were uncovered, and, with an immediate acceptance of their value, turned over to the Public Records Office in Belfast. These documents, 128 handwritten pages by Kelsey, jointly published as The Kelsey Papers by the Public Records Office of Northern Ireland and the Public Archives of Canada, did much to dispel all doubts. They were a meticulously written record kept by Kelsey, some describing his far-reaching travels into areas of Canada's West where no white man had previously trod. The care with which he had provided detailed descriptions of the varying vegetation and geographical features permitted little doubt in the validity of claims regarding his journeys. Confirming earlier beliefs in his achievements, these papers contained a first hand record of human courage and endurance. There was now detailed recorded experience from a white man who had been the first to live and travel on the prairies, and the first to see the immense Buffalo herds on those plains. The actual date is uncertain, but it is generally accepted that Kelsey's year of birth was 1670, the year of the granting of a Charter to The Governor and Company of Adventurers of England Trading into Hudson's Bay. There is evidence that he came from humble parentage, however, it is recognize that some person with his welfare in mind had provided him with an education above average for a boy of that era. His facility in acquiring new languages and his grasp of mathematics in learning navigation are recognized as requiring an educational base not possessed by an untrained waif of the streets. At the estimated age of 14, in 1684, he was apprenticed to the Company. Embarking on the Lucy on England's Thames River in the same year, he sailed for Hudson Bay and into a period of 40 years of life during which he was to earn lasting fame in Canada's history.